What is the certification Label? It’s a permanent label found on the B-pillar or the driver’s door edge. 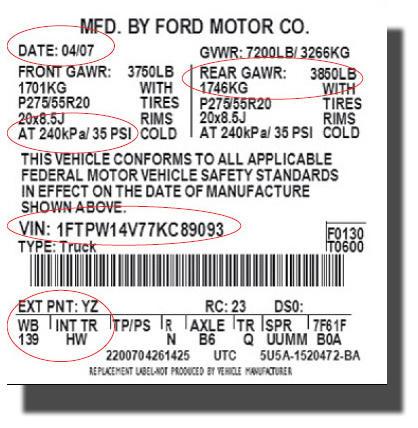 Federal law, enforced by (NHTSA), requires every new vehicle to have a certification label. NHTSA stipulates the minimum content and even the size of the letter on the label. The type of material and the expected life of the label is spelled out by NHTSA as well. In fact, Automotive ID’s replacement program was reviewed by NHTSA at the request of US Senator Christopher Bond. Although NHTSA cannot endorse a particular program, Automotive ID was informed that their replacement program is not in violation of any federal regulations. This label is like any other part that is replaced in the collision repair process. It’s not the VIN plate or tag – it’s a secondary identifier of the vehicle only. 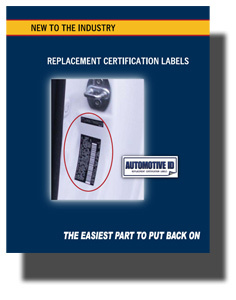 Replacement Labels are new to the collision repair industry. A replacement driver door or a repaired B-pillar requires the certification label to be removed from the vehicle. Some shops torch the label out and throw it in the glove box. Some shops torch it out, make a copy and tape the paper copy back on. In either case, the shop isn’t getting paid for torching or copying the label. Absent a solution, most shops just ignore it. Automotive ID has the solution. Certification Labels for all makes and models in as fast as 24hours. An online ordering system that’s easy to use and maintains a thorough record of each replacement label issued. No emailing, no faxing, and no phoning-in credit card numbers. It’s all done online. Within 1 business day of ordering, your label can be at your shop if your zip code receives express mail from the US Postal Service. 1 or 2 day production turn-around plus US Postal Service first class mail transit time.